The next time you stroll through the cereal aisle of your local supermarket, you might be surprised that the most sugary flavors are actually shelved beneath the adult-oriented brands. In fact, they’re at just the right height to be accessible to children. It’s no coincidence that some of the most tempting treats in the supermarket are located within reach of young hands. Here’s why sugary cereals are placed at eye level with kids. Keeping items like sugary cereal visually and physically accessible to kids is an effective way to sell more product. Though you may consider yourself a well-informed shopper who makes decisions based on research and personal preference, the fact is that you’re actually more likely to take home items that are shelved at eye level. “What you see is what you buy. This has been researched pretty extensively: what’s easy and accessible to our eye has a higher probability of us buying. Looking up, looking down, bending over or reaching require additional energy and reduce our likelihood of purchasing,” Jason Martuscello, MS, MBA, behavioral science strategist at BEESY told INSIDER. For this reason, cereal brands that are oriented towards children actually pay “slotting fees” or “slotting allowances” to be shelved lower so that they are at eye level with kids. According to behavioral scientists, vision is the dominant sense in buying. Keeping items like sugary cereal visually and physically accessible to kids is an effective way to sell more product. Characters used on cereal boxes appeal to kids. It’s no secret that kids love cartoons, but there’s actually a strategic reason that colorful characters are splashed across nearly every sugary cereal out there. As Martuscello explained, companies use characters to appeal to kids because they can actually make children feel loyal and connected to a particular brand. “Humans are drawn to other people. Brand characters add reality to lifeless, boring and emotionless brands and products. The more we can make products ‘come alive,’ the more we buy, the more we pay, and the more we are loyal to them,” he said. Having cartoon spokes-characters also allows companies to connect with their youngest customers even before they can read a label or say the name of a product. “Supermarket shelves are literally one of the first places a brand can speak directly to children before kids are even able to speak,” Byer said. Kids tend to trust characters they can make eye contact with. The placement of cereal boxes on grocery store shelves might be about more than just easy access for kids — it seems to influence how much eye contact children make with the characters on the boxes. In one study, researchers measured the shelf placement and eye positioning of 86 cereal spokes-characters in 10 grocery stores in the US. They found that cereal box characters made more eye contact with kidswhen they appeared on lower boxes. 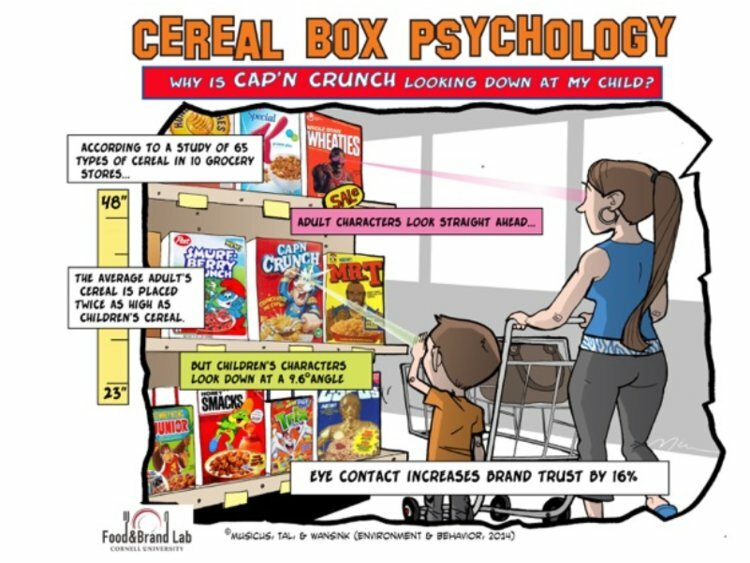 That might not sound like a big deal, but the researchers also found that making eye contact with cereal spokes-characters actually increased kids’ feelings of trust and connection with the brand. Kids in the study more frequently opted for the cereal brands with characters they had made eye contact with. Martuscello confirmed this phenomenon, explaining that the sensation of having a character “look” at you has been shown to impact attention, feeling of connection and trust and ultimately being chosen. “The more we perceive humanlike qualities in other things and feel a sense of connection with those qualities, the more we will pay attention, buy, and remember,” he said. Kids have a surprising amount of purchasing power. “Kids have a tremendous influence on consumer spending. Recent studies have shown that in the US there are 50 million kids age 11 and under who wield $1.2 trillion in annual purchasing power. 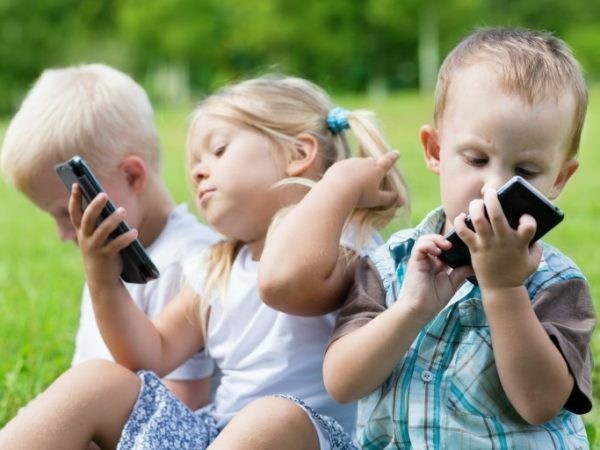 Children’s opinions today will influence consumer trends far into the future,” Byer explained. In fact, Byer pointed out that children are the targets of carefully constructed advertising campaigns outside the grocery store as well. Social media is fertile ground for marketers looking to get young eyes on their products. “Many parents aren’t even aware that their kids are being marketed to directly on all types of media platforms,” he said. Ever notice produce is at the front of the store? “For example, the check-out area is littered with impulse items (e.g., soda, candy, gum) that sell extremely well because customers are psychological and emotional primed to buy. Some are tired, others have exhausted their willpower by that point, and for others just reward themselves for their shopping,” Martuscello revealed. The idea that shoppers have limited willpower to resist buying indulgent treats is also used to help sell products and healthier snacks. According to Martuscello, the produce section is usually the first thing you see when you walk into a grocery store because our energy and willpower to make healthy choices is the highest right at the beginning of a shopping trip. Even the shape and weight of an item is carefully considered, as people are more likely to take home products that they can easily lift and put in their cart. These tactics could be health-promoting. Even though behavioral science is used by many companies to sell products that aren’t exactly health-promoting, the same strategies could be used to market more wholesome items to both kids and adults. “If you want to increase sales of healthy products (or any products for that matter) you need to understand the science of how people buy. The more brands can understand the psychology of their customer’s buying behavior the more they can connect with customers and win at the shelf,” Martuscello told INSIDER. Byer added that companies should take the initiative to begin applying these tactics to selling healthier food. “It may even be our moral responsibility as marketers to change the paradigm and start thinking this way,” he said. Is a news site a news site if it’s published by Verizon?